As I write these words, I am in earshot of a low intensity fistfight that has been happening, off and on, for the better part of 10 hours. Most of the violence has consisted of pinches and slaps, and there is little danger that it will escalate beyond frog punching, so my intervention not needed. My only concern is that it's participants, Mailer and McQueen, are both proud men, and that it might realistically continue well into the night. After last night's engine fire effectively ended our chances at victory, I suspected that our team morale might be running low today. That, coupled with the mysterious disappearance of one of our meatball sandwiches, was enough to set those two off against each other. I don't pretend that they have ever been friends, and I know they tolerate each other only because of their mutual fondness for me, but I still hold out hope that they might someday appreciate each other's company. The reason I thought entering the three of us in an off-road Motorcar rally would hasten the arrival of that day escapes me now, but I had the best intentions. If nothing else, this trip has been worth it just to experience the rich culture that surrounds Greek motorsport. Just a few moments ago, the race organizers finished digging the trench that will soon be filled with wine. The camaraderie that forms around the wine ditch is only matched by the brotherhood of war. As I have learned to do, I will jostle and shove my way to a prime spot. Until now, I had assumed the phrase I'd heard over and over in western Greece, "Drink fast or drink mud" was some idiomatic toast. Now I see that it is simply good advice. And now, just as I had given up hope, I hear that Norman and Steve have finally come to a truce. 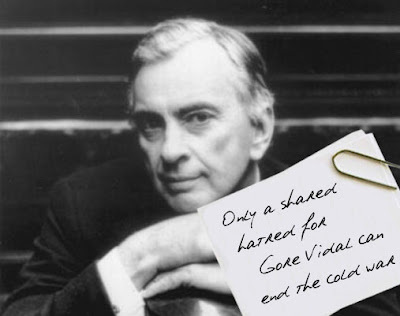 It sounds like they were finally able to bond over their mutual distaste for Gore Vidal.